A fresh coat of house paint may be the last line of defense to protect the exterior of your home from moisture and the impending wood rot that often occurs during tough seasons. Failing to take the necessary steps to protect your home in the first place can be even more costly when you have to pay extra to fix the damage. It may not seem like it now, but trust us, it’s much easier (and less expensive) to invest in protecting your home with professional services from our exterior painters in Columbus Ohio now rather than later. If a home goes unpainted through the seasons, you may end up with extensive wood damage that could cost thousands to repair. The easiest way to prevent this is with a fresh coat of paint before winter weather sets in. Luckily, Sharper Impressions Painting Company in Columbus can provide the exact exterior home painting services you need to prepare your house from harsh weather conditions before it’s too late. Good exterior home painters with quality paints can protect the outside of your home for ten years or longer. It’s amazing that just a few minor updates to your home’s exterior can completely transform your house. With Sharper Impressions’ exterior painting services, not only are you investing in the health of your home, but you’re also guaranteed to make your neighbors jealous. 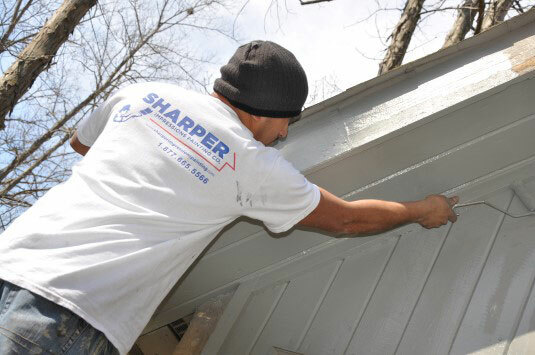 No matter what exterior home painting services you are in need of, Sharper Impressions has a solution for you. Painting the exterior of your house is the most cost-effective home remodeling project if you hire the right exterior painters. Imagine, for a nominal cost, completely changing the colors and look of your home! By simply painting your home with modern, updated hues, it will change so much that your friends and neighbors will do a double take when passing your house. Looking for an exterior house painters in Columbus Ohio to give your home a fresh look? Call Sharper Impressions Painting Company today to schedule a free estimate, or request a free house painting quote by filling out the form below! We also provide exterior painting services in Indianapolis, Atlanta, Kansas City, and Nashville. Get your free painting quote!